I treated myself to a copy of ‘The Redbreast’ by Jo Nesbo when I was in Matlock a few weekends ago after asking your advice on some crime writers as I started a major crime binge. If you don’t love crime novels fear not as I will be spreading the reviews from that reading binge over a few weeks on the blog. Nesbo seems like the man of the moment in terms of crime and has even been labelled ‘the next Stieg Larsson’ and so it seemed that he might be a good place to start, even though I don’t normally follow the hype. But if everyone is raving about someone there has to be something in it doesn’t there? It also appeared had quite a few fans in all of you, would I be hooked? I am someone who has to read a series of novels in order, this does only apply to a series I don’t have to read an authors works in order at all. ‘The Redbreast’ is the earliest of the Harry Hole novels to have been translated from the original Norwegian and so it seemed the ideal place to start. As we meet Harry Hole for the first time he does something which could leave him without a job, as he accidentally shoots a secret agent he believes is an assassin, instead however due to the circumstances he actually gets a promotion which puts him in the path of another mystery as a rare and unusual gun seems to have come into the country. What could someone possibly want with such a weapon and how could it be used? I have to say when this turn of events seemed to become more and more apparent I was beginning to think ‘oh no, I am not sure this assassin stuff is going to really be my kind of crime novel’ yet as Nesbo carries out Harry’s story he interweaves two other perspectives. One is again in the present day and sees an elderly gentleman acting most ungentlemanly in many ways both dealing with those on the wrong side of the law and also in murderous ways. We also get a very interesting back story set in 1944 (and becomes like a separate tale of war with both its battle fields and a love story) which Nesbo weaves and alternates on and off throughout the modern day tale combining a tale of the Nazi’s in the war with neo-Nazi’s in the present. In fact in some ways it’s this rather different way of telling and setting up a crime novel that made it stand out. Before anyone jumps on that I am aware other authors will have done these historical tricks but this did actually feel different it was like reading a historical literary novel in some ways as well as a crime novel. 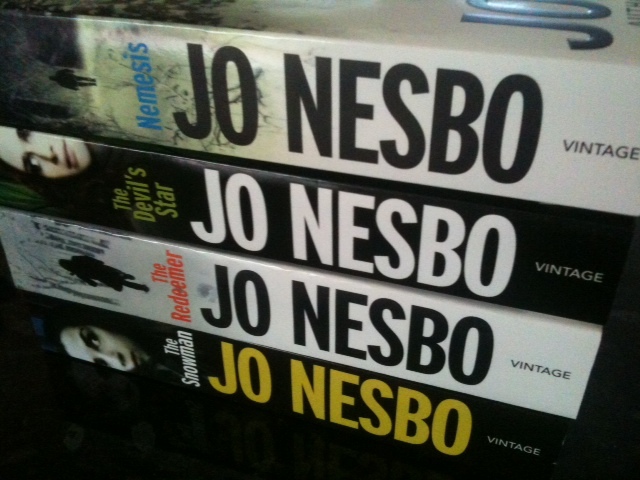 I did occasionally find that Harry Hole, whilst interesting enough, was never quite fully drawn and riddled with those great modern crime detective clichés. He likes his drink, he doesn’t seem to relate to anyone else that he works with, he can’t seem to hold a relationship down, is a bit of a loner. I also didn’t find it as page turning as I had been initially promised as I was occasionally confused at what was going on with which of the many characters. But I was hooked in and did read it fairly quickly just taking a breather now and again to make sure I had caught up with it all in my old head. I cant say too much about the plot either because of this and because I don’t want to give too much away as I did guess how everything interlinked before Nesbo officially let me in on it. I did find it interesting, and quite exciting, reading other reviews of this novel that ‘The Redbreast’ is seen by some of his fans as a weaker novel – is this true? Have you given into the Harry Hole hype and if so what did you think? Is this a series you have had on your radar, tempted?